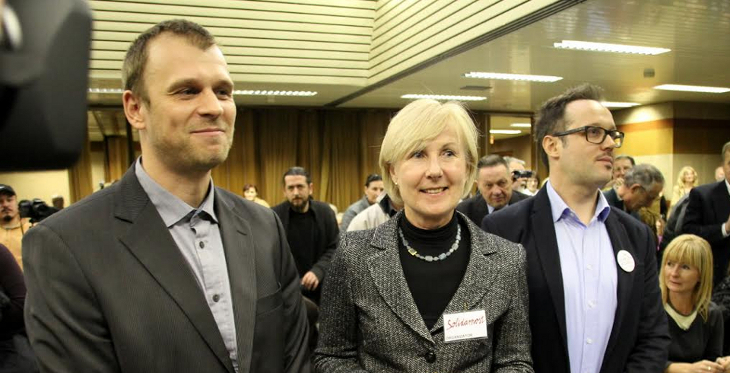 A new political party was formed in Slovenia on Saturday. In a country with 78 political parties and organisations this might not seem terribly important, but since Solidarnost (Solidarity) was formed by several people and groups integral to the popular uprisings in late 2011/early 2012, they do deserve a second glance. There has always been talk about new parties being formed out of the protest movement. But – as always – going from reaction to proaction proved much harder than many imagined at the height of the protest wave. Thus it is no wonder that it took almost a year for a new party to form. Especially since this is (broadly speaking) a left-wing party we’re dealing with here. And while political forces on the right traditionally care strongly only about a handful of issues, left-wing players care strongly about a zillion things. Each of them about a zillion different things. OK, so pengovsky is exaggerating to make a point, but you get my meaning. If the common denominator of the protest movement was the administration of Janez Janša and its broad-sworded austerity policies, it was anything but easy to find a new common denominator of a heterogeneous group of strongly opinionated people whose initial motivation for entering the political arena was the questionable legitimacy of the existing political establishment and its power structure. I guess the best, albeit slightly stretched comparison would be if the NY Occupy movement tried to enter the race for New York mayor. In fact, the process was apparently so difficult, the party does not have a president, but rather a three-member presidency, comprised of Uroš Lubej (leader of one of the protest groups), Damjan Mandelc (a sociologist and political activist) and Marina Tavčar Krajnc (professor at Maribor University). Anyways, point is that it took a while for Solidarnost to form. Now what? Interestingly enough, several polls published in weeks leading up to formation of the party showed a “protest movement party” would resonate heavily with voters, with at least one poll giving such a party as much as 40%. However, that was before Solidarnost’s platform was adopted and published. And therein lies the key to understanding the phenomenon. People smarter than me (yes, there are a few of those, shocking as it may seem) made a good observation that the new party could become a focal point of voters’ wishes and projections. This, in fact, is probably the reason why “a protest party” scored so high in the polls. It is a pool of votes Solidarty can draw from. But if the difficulty of party-forming process is anything to go by, the expectations the voters have of the new party are even more wildly apart from each other than those of the founding members were. Point being, that Solidarnost is entering a heavily opinionated, heavily populated and heavily fractured territory, where few breaks are given. Not that the new party leadership is helping it cause, indiscriminately portraying the entire existing spectrum as “parties of the capital”, positioning itself further to the left. And despite what Slavoj Žižek recently wrote, that the only true left is today known as the “far left”, that is not a recipe for capturing much of the aforementioned 40%. Even worse, comparisons with German die Linke were floated around, which isn’t exactly helping if you’re trying to capture a plethora of voters of wildly different profiles. In this respect, it is the least of Solidarnost’s problems that the media spotted a number of former LDS members at the event. Although this immediately resulted in it being painted a bypass-party for the heavily indebted and barely functioning LDS, Solidarnost really shouldn’t worry about that too much. They should, however, worry about being boxed into a corner and left (sic!) there to rot. Namely, apart from the LDS connection, the evergreen rumour that former Zares leader Gregor Golobič is behind all of it. Or, – this from the right-wing media – that the new party is an “offshot of the Communist party and its remnants”. But since every self-respecting LDS member still crosses the road whenever he or she sees a Zares member approaching on the pavement and both will rather jump into the Ljubljanica river than be seen with an old communist hand, you can’t have it all. OK, I’m exaggerating a bit again, but you get the point. The left is fractioned. But the powers that be apparently see Solidarnost as enough of a threat to the “established order” that they will use every tool in their (for the time being) rhetoric arsenal to paint the party as “one of us”, the argument being that they’re all the same anyhow, but with the old guys you at least know who’s who. Years ago Gregor Golobič “accused” pengovsky of declaring Zares D.O.A.. Fun times, those were. 🙂 But while not dead-on-arrival, Solidarnost is risking crib-death by starting to play the game others want it to play and allowing its position on the political spectrum to be determined by the established political players.